Some material in this post was originally published in June of 2010. 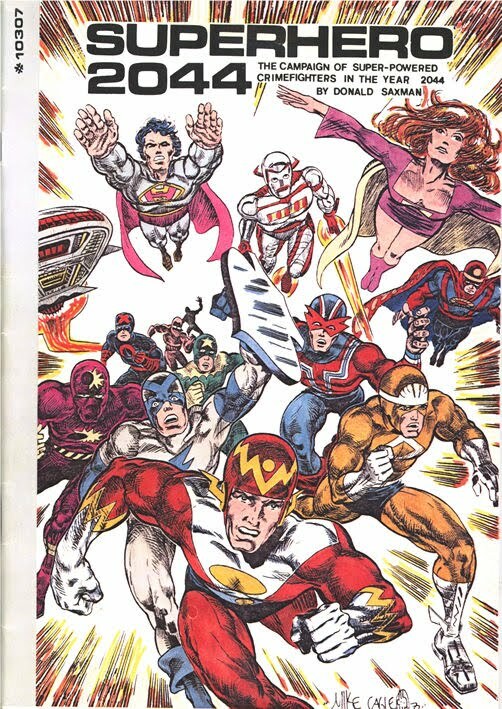 Since that time, the excellent Age of Ravens blog has written a series on the History of Superhero RPGs that gives brief synopses of these games through the ages and James Maliszewski has published an essay by Superhero 2044 creator Donald Saxman. The Saxman essay, along with my June 2010 post, were included as additional materials in the 2010 reprint edition of Superhero 2044. As you will read in the discussion below, I was nicely surprised by Superhero: 2044. It is a clear demonstration of the wild creativity of the early RPG community, but also an example of how hard it is to create games in a chaotic environment. This series will attempt to review and discuss most of the major superhero roleplaying games, and a couple of key supplements, that have been published. Given that I own the vast majority - though sadly not all - of the superhero games that have been published to date, this should be a fun exercise. I will be blogging about the games in the order they were published, so Villains and Vigilantes (1st Edition) and Supergame will be the next games in this series. Donald Saxman was inspired to create Superhero 2044 when he was a player in a D&D campaign run by science fiction and fantasy author John M. Ford. 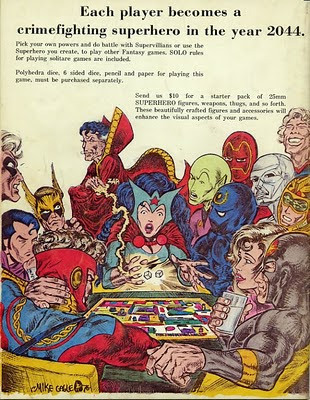 Ford's game featured an adventure in which, "the party of magicians and swordsmen met Batman and Doc Savage, and ultimately fought Doctor Doom and Darkseid with the help of Luke Cage and the Phantom Stranger." From that short bit of description of Ford's campaign from the Superhero 2044 rulebook, one can see how this kind of high concept mashup could inspire players to design all kinds of things. 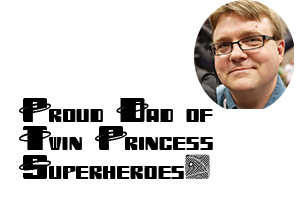 With the help of his friends, and nearly two years of design and playtesting, Donald Saxman created the Superhero 2044 role playing game. While Lawrence Schick states that the game was influenced by D&D in Different Worlds, a close reading of the game shows that few if any of those influences were mechanical. Saxman writes that one of his chief influences was GDW's early rpg En Garde and that he made a conscious effort to avoid being influenced by D&D. Superhero 2044 begins with a description of the game universe. The majority of game play will take place on the island of Inguria, a city that is kind of a cross between Macross City and the future cities of the Legion of Superheroes. There are a number of creative influences on exhibition here and the combination results in one of the game's biggest assets, a rich world in which to play. Like many games being released around the same time, Superhero 2044 features a point based character build system where players have 140 points to spend on a number of character attributes (Vigor, Stamina, Endurance, Mentality, Charisma, Ego, and Dexterity). While some of these attributes share similar names, they do have different functions and one- Stamina - would have benefited from a different name as it represents hand-to-hand fighting ability and overall physical capability. Players also ten pick one of three archetypes (Ubermensch, Toolmaster, and Unique), each of which modifies starting attributes accordingly. While there are no "strict" minimum values to the stats, there are effective minimums in order to avoid penalties. One requires a minimum of 20 Endurance, 11 Vigor, and 6 Dexterity in order to function at a normal level. Given that the Toolmaster starts with -10 points to the starting value of Endurance, a player would have to spend 30 points on Endurance to avoid penalties. It might have been better to have the statistics start at base values and allow players to buy them down if they want to represent some disadvantage. One could, for example, have started characters with those minimum statistics and only 103 statistic points. One might also have created more uniform base values for the statistics. All three of these concepts quickly enter into superhero rpg design, for point based systems anyway. Once the points are spent, the players are allowed 50 bonus points to add to one of these in special circumstances in order to emulate some power. The example given is 50 extra Endurance vs. Bullets and some recommendations are made to base super powers on weapons and gadgets contained in the game. Though there is a point based system for the purchase of attributes, there is no such system for super powers. Donald Saxman had intended to write three books for he Superhero 2044 system in which one of the later books would provide such a system, but those books were never published. This doesn't mean that no power design rules were ever published. 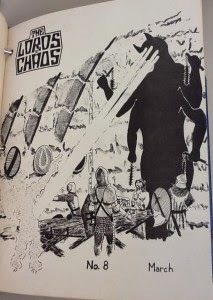 Wayne Shaw - who I interviewed on the Geekerati podcast - wrote an extensive super power design rules set in Niall Shapero's excellent The Lords of Chaos fanzine and Shaw offers some ideas in the insert to the 2010 reprint of the game. Because of the lack of a super power design system, the game sat on my shelf for some time. When I did read the book, I found it to be much better than I expected. While I would argue that without Wayne Shaw's additions in The Lords of Chaos issue 8 the game would be challenging to run,without Superhero 2044 modern super hero role playing would not be what it is today. The game had a significant influence on the super hero games that came after Superhero 2044 and if it hadn't been written there would be no Champions, Supergame, or Golden Heroes. Each of those super hero games lifts a concept out of Superhero 2044 and structures a game around that concept. As I mentioned earlier, it was the first superhero game to include point based character construction. Though the point expenditure was limited to the building of a character's "attributes" and were not a part of "power design." This innovation, and at the time of Superhero 2044 this was a significant innovation, is one of the major design starting points for a number of super hero role playing games -- not the least of which is the Champions game. The Champions first edition rule book mentions the influence that Wayne Shaw's character creation rules had on the game's early design, but the influence Superhero 2044 had on Champions reached beyond the character design system. In addition to being inspired by the point based character design of Superhero 2044 it is evident that Champions melee combat system was influenced by Donald Saxman's game as well. The weekly planning sheet is one of the most intriguing aspects of the Superhero 2044 game and the most playable aspect "out of the box." The game includes weekly planning sheets that provide a number of "activity blocks" to which players assign particular tasks, like fighting crime or resting. Golden Heroes, Games Workshop's super hero role playing game, featured a campaign system that bears no small similarities to that of Superhero 2044. Games Workshop was, and still is, the publisher of White Dwarf magazine and so it is easy to believe that this game review sparked some discussion of "planning sheet" style campaign play. It would be a dream come true for me if both Wayne Shaw and Donald Saxman would agree to work with me to run a Kickstarter of Superhero 2044 Second Edition that incorporates some of Shaw's changes while keeping the basic system as is. Such an endeavor would be a truly OSR adventure and one that I think would be worth exploring. What would a more developed version of the game look like? I hope we get to find out.